LAKE BUENA VISTA, Fla.—Most teams avoid talking about expectations for their seasons. The AAU USA International Collegiate Team is different. Entering its third year, the past two playing as the Sant Boi Barcelona Falcons representing Spain in the Collegiate Baseball League Europe, the AAU USA International Collegiate team embraces expectations ahead of an intriguing 2018 summer in Scotland and Ireland competing vs those countries’ national teams and clubs. If any team is equipped to spark conversation, it’s v3.0 of the AAU USA International Collegiate team. 2018 has the program’s most experienced and accomplished roster, a fully loaded pitching staff, and promising newcomers that opponents must account for. Potential and talent only go so far though. Look back to the 2016 season, when the team was 11-3-1 and top-seeded before losing in the championship game. And last year, when injury and illness struck, causing two straight losses to end the season 10-4-1 one game short of the league title game. But if AAU USA International Collegiate can navigate a blitz schedule that includes opening in Scotland at Edinburgh, a doubleheader in Glasgow, back to Edinburgh for a doubleheader, then to Dublin for an international tournament in Ireland starting two days later, the team’s third season could be memorable. “The expectations to win are nothing new,” Graham said. “We were the CBLE’s winningest two-year program of all time, so our recruits and coaches and fans expect us to be the hunter not the hunted. “Another thing is, if you look back three years ago, going into the international collegiate summer league play, we had some young talent but didn’t know what to expect and were not sure we were ready to compete at that level. “As it worked out, we won two pennants and were right in the thick of the playoff races both years and just lost a couple games late and weren’t able to win the tournaments. It starts with five returners who lit up scoreboards and opposing defenses last summer to the tune of 54 percent of the team’s hitting, 47 percent of run production, 48 percent of total extra base hits (52% of extra base hit total bases), 44 percent of stolen bases, 100 percent of triples and home runs, and 55 percent of total bases. “That kind of production and experience returning is very unusual in collegiate summer baseball,” manager Graham said. “They’ve been groomed to play international baseball and have played a lot of it. “And after a few years of combined experience doing this now in the UK, France, Spain, Belgium, the Netherlands, Czech Republic, and Germany, they’re mature guys who have seen it all and understand how to respond to all types of situations. This year’s roster already has been cast having high potential, and while no one has predicted anything, Graham doesn't mind calling this the program’s best roster ever going into a season. Another factor that should bolster optimism is pitching. They will miss 2017 Top Gun and pro prospect Brian Reed (6-7, 235, Rochester Tech), but a pair of NCAA Division I righties, New Jersey Tech redshirt seniors James Sofield and Brent Jones; junior left-hander Joe Schipsi of NCAA Division III Cabrini University (Pa.); and rising college freshmen Daniel Keating (Wellington HS, Fla.), Ryan Cunningham (Middlesex CC, NJ, commit), and Kyle Davis (Anne Arundel CC, Md., commit) should do nicely. Also, there are several innings eaters available for work on the mound. Graham says the recruiting has gotten better. Ranking the levels of competition the players represent agrees. Using composite level of competition (D1 6.0, D2 5.0, D3 4.0, JUCO 3.0, NCBA 2.0, HS 1.0), 2018 is the top ranked recruiting class: 3.6 (2018), 3.4 (2016), 2.1 (2017). “Depth is better, recruiting is better, and overall we’re better." After a league-leading 2.7 runs allowed per game in 2016, last year’s defensive play took a step back (4.2 allowed). Offense though increased from 5.6 runs scored per game to 7.0 per game, enabling margin of victory to remain constant (2.8). He said the program is embracing the challenge of playing the national teams and clubs of one of European baseball’s rising countries in Scotland and Top 50 power Ireland, currently #47 in the world baseball rankings. The AAU USA International Collegiate Team is a premier international collegiate summer team followed by college coaches and pro scouts. The roster includes players ages 18-23 representing all college divisions. The experience offers high-level baseball and cultural exposure to the world at the same time. 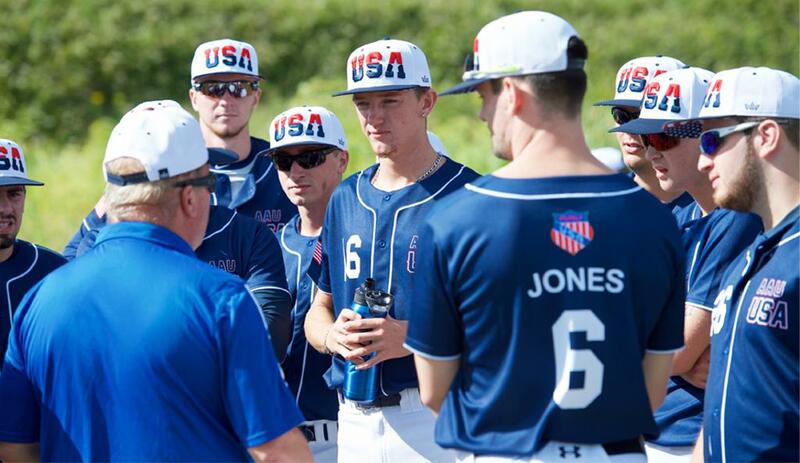 For more information about the AAU USA International Collegiate Team, visit https://aauusaict.wixsite.com/aauusabaseball, http://www.playaaubaseball.com/aau-usa-international. To keep up to date on the latest happenings, become a fan and follow AAU USA International Collegiate Team baseball on Facebook at https://www.facebook.com/AAUGlobal and Twitter at https://twitter.com/AAUGlobal.